Bunions, arthritis and injuries of the big toe joint affect your overall health and quality of life. Why does your big toe joint hurt? Did you jam it? Did you jump from a height? Has it been bothering you for a while, but is now a daily problem? Are you unsure what happened but woke up in pain? The big toe joint, as it is commonly referred to is the first metatarsophalangeal joint. It is where the big toe meets up with the forefoot. This joint is very important for a normal functioning foot and normal walking. Injuries, systemic conditions within the body and daily use can all affect how good or bad the big toe joint feels. Here you will learn about the reasons why pain may present in the big toe joint. I will also discuss what you can do for the pain and when it is time to see a professional. Beginning with what is undoubtedly the most familiar condition of the big toe joint, the term ‘bunion’ is used to describe a condition which podiatrists refer to as hallux abductovalgus. The mouth full of a term we use describes the abnormal position of the big toe. Often people look at a prominence of any kind around the big toe joint as a bunion and believe that it is an extra knob of bone that has grown bigger and bigger over time. The truth is, in true bunions or hallux abductovalgus corresponds with a bump on the inside aspect of the foot where the big toe attaches. While in some cases extra bone may develop in this area, in the vast majority this prominence seen is actually normal bone which has continually moved out of its normal position. As with many deformities in the foot, bunions develop over a course of time due to poor biomechanics in the foot. This means that there are tendon imbalances that occur depending upon your foot structure. Most commonly, bunions are seen in people with a low or flexible arch structure. This type of foot destabilizes a joint near the middle of the arch. If the arch structure is not supported the joint continues to allow abnormal motion and flexibility at this joint and the bone along the inside of the foot which connects to the big toe starts to drift. Over time, the joint surfaces adapt to this position and the tendons and ligaments stretch allowing the deformity to become worse and chronic. X-rays help to assess a bunion and reveal the severity of the deformity, based on the amount of dislocation that has occurred over time in the big toe joint and can give us an idea of whether the deformity has affected the actual cartilage. Bunions, due to this abnormal positioning can over time cause wearing of the cartilage in the joint and then be associated with arthritis in the joint. ‘Hallux’ is the latin term for the big toe and ‘limitus’ describes limited motion of this toe. Thus this term describes the condition of having arthritis within the big toe joint associated with limited motion and/or stiffness. Hallux limitus is typically seen as a bump on the top of the big toe joint which can become irriated from contact with certain shoes and eventually grinding or clicking can be noted with walking and deep joint pain develops as the cartiliage within the joint erodes. If this condition goes on untreated, the denuding (or breakdown) of cartilage leads to bone-on-bone rubbing and the joint eventually begins to fuse itself - no longer having the cartilage barrier. Hallux limitus, as mentioned above, may be a secondary condition that develops from a bunion causing damage to a joint that is chronically dislocated. It can also be a primary condition as an effect of poor mechanics in the feet. Some foot structures place the big toe joint at a disadvantage during the gait (or walking) cycle. These foot structures make it difficult for the big toe joint to fully flex when pushing off and over time, chronic stiffness, bone spurs and damage to cartilage can occur. Another cause of hallux limitus is a history of trauma to the big toe joint. A bad incident of jamming of the big toe can initiate the arthritic process in the joint – whether associated with a fracture or not. Finally, limited motion in the big toe joint can occur due to systemic diseases like rheumatoid arthritis or gout. These conditions damage the joint for different reasons than described but can lead to the same type of pain and limited motion. Turf toe is an athletic injury described due to the common correlation with injury on turf where soccer, football and other sports are played. This condition describes what is essentially a sprain of the big toe joint. The big toe gets stuck/caught in turf or on the ground and as the rest of the foot passes over it, the ligament around the joint is overstretched and sometimes torn. This results in pain, swelling, redness and sometime can be associated with a fracture if the force is high enough. If you or someone you know has ever experienced pain in the big toe joint that seems to have started ‘out of nowhere’ without any recollection of injury, this is often times gout. This incredibly painful condition causes a quick onset of redness, swelling and warmth around the joint. It resolves on its own, but in most cases, the pain is severe enough that people experiencing an attack will seek treatment as soon as possible to get relief. It is common that people suffering from gout have pain that is excruciating with only the weight of a bedsheet. Gout is caused by an abnormality in protein breakdown in the body. 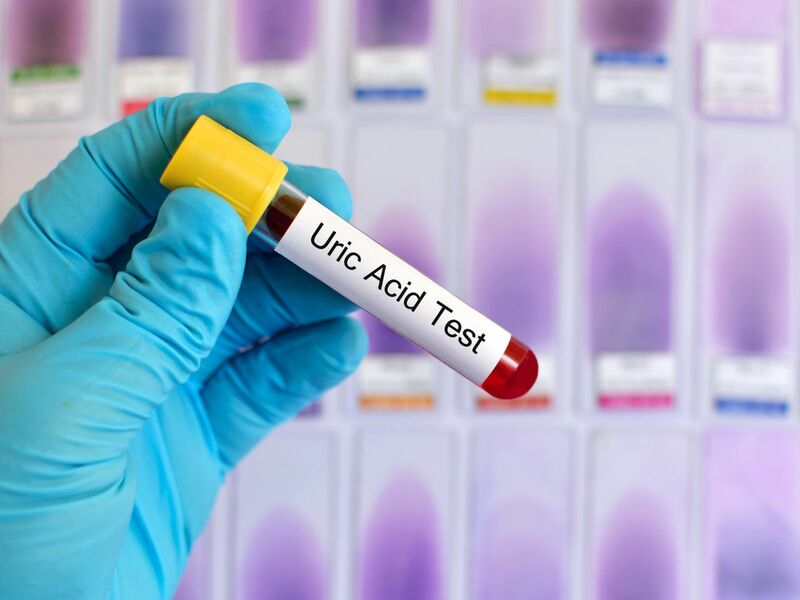 When proteins normally breakdown, a biproduct called uric acid is created. In people who suffer from gout, the uric acid is either over-produced or under-secreted by the kidneys which leads to abnormally high levels in the body. As a result, the uric acid crystallizes in joints-most commonly the ankle or big toe joint. While under a microsope uric acid crystals looks like a pretty picture – it is anything BUT pretty. Chronic bouts of gout cause chalky deposits within the ligament around the big toe joint (the capsule) and over time, the condition can cause erosions of the bone on either side of the joint. Sometimes diet can help reduce attacks of gout, other times medications aid in keeping the uric acid levels in the body within a normal range. Sesamoid bones are small round bones that occur in the body – one great example is your knee cap (or patella). On the under side of the big toe joint, everyone has typically 2 sesamoid bones. They are about the size of a chickpea and site side by side, embedded within a tendon which pulls the toe down toward the ground. Sesamoiditis presents as pain on the ball of the foot aspect of the big toe joint. These bones can become irritated in bunions, as their position is also dislocated as the metatarsal bone drifts toward the midline of the body. The sesamoids do not move with the metatarsal always and this means they begin to rub abnormally on the underside of the big toe joint. Sesamoiditis can also be due to injury, either from landing on the ball of the foot from jumping some height or from running – especially if shoes are worn down or minimalist. For any of these conditions, icing and anti-inflammatories can help temporarily reduce pain. Some shoes are better than others to support the foot which indirectly reduces inflammation and irritation. In the cases of hallux abductovalgus (bunions) and hallux limitus, the pain is likely to return because there isn’t much to do at home to improve the biomechanics of the foot. In these instances, seeking a professional evaluation is beneficial to assess the degree of deformity and joint damage through a thorough exam and x-rays. Paddings, straps for the feet and ultimately custom orthotics help to redistribute the weight in the feet and aid in getting the feet into their best functioning position to reduce the muscular imbalances which allow these conditions to worsen over time. When necessary, surgery can be performed to correct a bunion deformity and bone spurs associated with hallux limitus. When it comes to an injury of the big toe joint, if pain does not substantially improve in 2-3 days or if the injury causes you to be unable to bear weight on your foot a visit to your podiatrist is the best way to ensure no bone or joint damage has occurred. In these instances, support of the affected area with a boot or brace or strap help to allow the body heal from the injury and reduces future sequelae (or side effects) from the condition. Gout, as mentioned earlier, usually gets people to a doctor sooner rather than later due to the intense pain. When gout is suspected, there are a couple of benefits to seeing a professional. First, the strength of anti-inflammatories available over the counter is not often enough to improve symptoms from gout – so a physician can get a better anti-inflammatory prescribed. In addition, when acute joint pain occurs, an in-office procedure called aspiration and injection, improves the condition and allows for full evaluation to diagnose gout definitively with biopsy. Aspiration of the joint means that the inflammatory fluid (with uric acid crystals) is removed from the area with a needle and a cortisone injection helps quickly resolve inflammation – making oral anti-inflammatories less necessary. Once gout has been definitively identified, consultation with a rheumatologist is recommended in order to come up with a plan to reduce future bouts of pain and attacks. Pain in the big toe joint can be very debilitating and can affect your quality of life and overall health. Many people come for an evaluation of their condition and are relieved to have more information about their feet and what treatments are recommended. Being educated about your particular diagnosis allows you the best opportunity to work with your foot doctor toward a solution that works for you to keep you going and keep you out of pain!